We have a new addition to the family. Meet Jesse-Jay!! He will be known as JJ for short. I knew Inca getting used to him would be a challenge, after all she has been the ONLY dog in the house for 11 and half years and had my undivided attention. But I was stuck in a situation where she is not getting any younger, and I need a dog to be able to remain independent in my own home at least. I looked into the route of a trained Assistance Dog, the waiting lists are long.. 5yrs on average for most for first time owner. 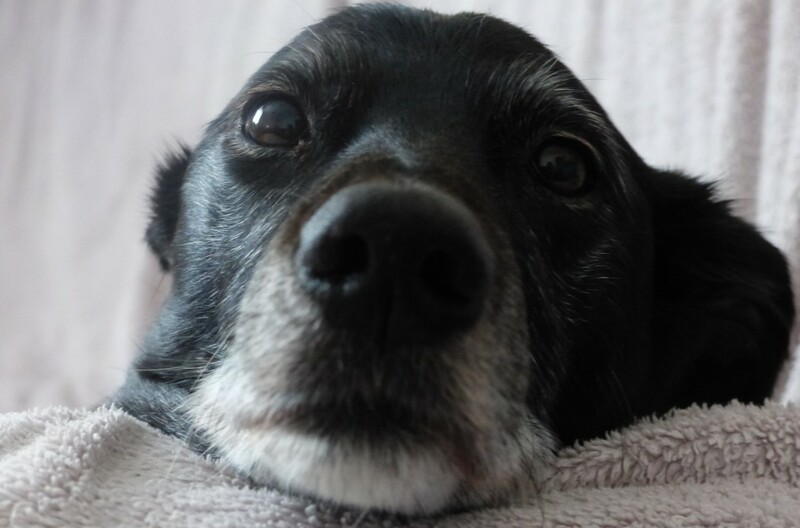 (18months – 2yrs for replacing retired dogs if you already had one) I heard of one lady who’d waited 7yrs for a Hearing Dog and as far as I know she is still waiting. As Inca will be 12yrs old next March that was not a practical solution for me. I also decided after looking at many breeds and crossbreeds, that what I really REALLY wanted was a pedigree Border Collie, if this was going to be my last chance to manage a dog from a pup again. He is a couple of months younger than Inca was when I got her. But he seems very bright even at this young age! I’ve tried him out on a few of Inca’s interactive food puzzles already and he doesn’t take long to catch on at all! Toilet training has been a breeze too! it doesn’t take him long to figure out this basic puzzle! Inca didn’t want much to do with him when he first came and her body language was very obvious when he came anywhere near her. I couldn’t even get a pic of them anywhere near each other at first without her snarling and snapping at him, but she has got used to him and armed with bits of sausage to reward her for letting him gradually nearer (while under my control on harness and lead) she is gradually getting used to him! Getting closer but Inca’s still not keen! So… we’re getting there!!! . hopefully by the time he can come out for walks with us – about 3 weeks (Vet says one week after his second vaccination) I should be able to get them walking side by side so she can teach him how to walk alongside my scooter. We’ve had bad rain for most of his first week so the back garden has been too soggy and muddy to take powerchair in to ride over grass, so that’s next on my ‘to-do’ list for this next week as we’re due a cold spell, so the grass should be nice and solid!